I received a review copy for my stop on the blog tour at Donnie Darko Girl. When The Legacy begins, Raevyn is on her way to a prestigious Ivy League school for African Americans. Sounds like a dream, right? Well, the problem is she's being dragged against her will. Raevyn's dad pulled a lot of strings to get her enrolled, and she has to pretend to fit in because she's in some sort of trouble and there's nowhere else for her to go. She has to rely on her cleverness to make up for what she doesn't know. A really crappy situation all the way around. 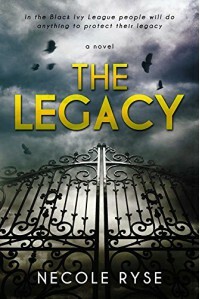 I think this book about gave me a heart attack - I was terrified Raevyn's secret would come out, that she isn't a legacy and had major strings pulled to get into the school. I kept waiting for her to be found out, and then I wasn't sure what would happen to her. As the plot unfolds, you find out more about Raevyn and why her dad forced her to go to B.W. Fitzgerald. Regina, Andrea, and Corrine are the three girls who taken Raevyn under their wing, yet she finds herself on shaky ground with them. There are moments where she truly has fun with them and they're like real friends to her, but then there's times where she feels out of her element around them. Think of Mean Girls. You never know where you stand with girls like those. Not really. Then there's the two guys at the university who both try to win Raevyn's affection - Andre from her French class and Jeffrey. Something about both of them seemed off to me, and I couldn't help wondering why Raevyn allowed herself to be romanced by them when she was still planning a future with the guy she was forced to leave behind - her boyfriend, Antoine, who's in prison and also part of the trouble she's in. I was dying to find out why Raevyn's dad never mentioned he went to B.W. Fitzgerald, who wants Raevyn gone badly enough to threaten her, and what was going to happen next. What sort of trouble was she in with Antoine and could she really trust him? I wanted to uncover her family secrets as much as she did! All of these thoughts kept me turning the pages quickly, and the suspense ratcheted up several notches. The Legacy does end with a cliffhanger, and I'm looking forward to the next book.